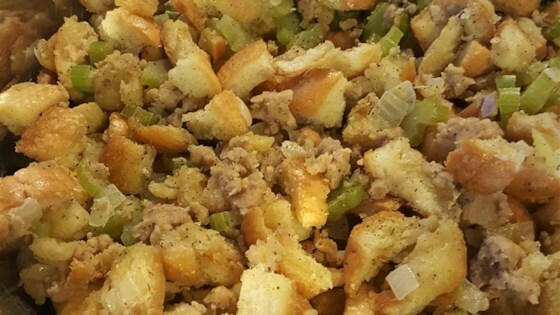 "This stuffing has lots of flavor and is nice and moist. You can also change the ingredients to your liking. I quadruple this recipe and make the extra in my electric roaster, that's how much everyone loves it. This recipe is very adaptable, you can change it around anyway you like and it will still be delicious!" Place sausage in a large, deep skillet; cook over medium-high heat until evenly brown, about 10 minutes. Remove sausage from the skillet and let drain on paper towels. Combine melted margarine with the sausage drippings until there is 1 cup of drippings and margarine combined. Cook and stir onion and celery in the margarine-dripping mixture in the same skillet over medium heat until onion is tender but not browned, about 10 minutes . Stir in about 1/3 of the bread cubes. Pour onion mixture into a large bowl and stir in remaining bread cubes, sausage, poultry seasoning, and pepper. Watch your hands, it's hot. Mix well. This stuffing is ready for baking. This recipe did not have the oven temp or cooking time????? Fantastic! Simple recipe but it packs a lot of flavor. This was a big hit with my family.